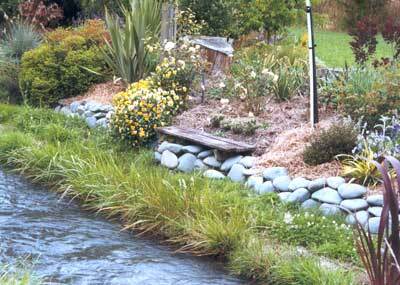 When I was busy developing the Dog-Path Garden I created a wooden seat on the low stone wall by the water race. Actually, 'created' may not be the right word. The wood was part of an old table top and I've just balanced it on the dirt. My seat worked - for a while! It was never a sensible summer seat because there was absolutely no shade, but in winter this seat had a sense of quiet magic. The water running by made gentle gurgling noises, and often my dog would crash straight through the water to visit me. I could see upstream as far as the plank and the Willow Tree behind it. 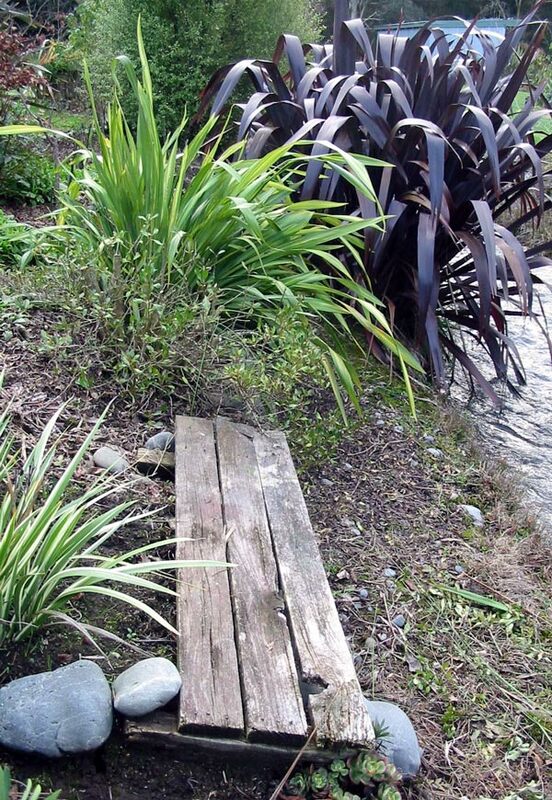 One of my first plantings was a large dark red flax at the water's edge. It kept on growing fatter and wider - you can see it in the above photograph, taken way back in July 2004. The plantings surrounding the Dog Path seat were varied. I poked some succulents (Echeverias) directly underneath the seat planks. 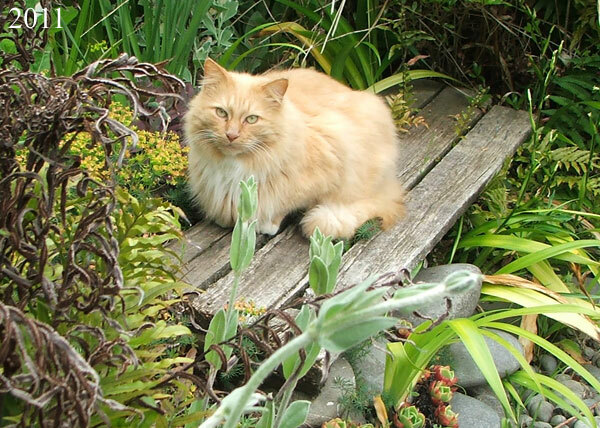 I keep changing my mind about the nearest plants - in fact I occasionally changed my mind about the exact position of the seat! My first plant ideas were a row of 'shrublets' of a variegated Euonymous along the back, and pansies falling over the stones to one side. 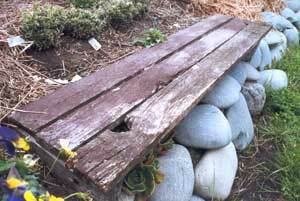 And, of course, there had to be a little path, edged in river stones, to reach the seat. There were some fragrant roses growing nearby - the strongest scent came from the soft pink rose Sharifa Asma (my rose book describes it as 'honey-like'). The old rose Reine des Violettes used to live further back, and nearer the seat I planted two apricot roses, fundraisers for New Zealand Dressage. If I looked up over the water I was level with the back of the garage, a this time a place for old planks and rubble. And the old dog kennel there was a visible feature. Sitting quietly on the Dog-Path seat in spring, families of ducks with ducklings would floated past. By the time they'd reach me they were committed to their direction of travel, and I would try to stay very still as they flap and skim past. I'd hope that my dog wouldn't choose that particular moment to check me out! I'd watch the surface water dancing, there'd be some loud sloshing sounds and Taj-dog would will arrive midstream - too late. Phew! Oh dear. Finally after years of weathering the seat boards just gave way. Surrounding shrubs grew too fat and too tall So I turned the path back into garden, with roses and daffodil bulbs newly planted. I'm afraid it's 'Rest In Pieces' for the Dog-Path Garden Seat. Solemnly one autumn afternoon, when no-one was looking, I threw the remains on my bonfire.